1. a library is a public space and you can go to it for free. you can sit for as long as you want and do many things without even needing a library card. 2. many libraries have heat in winter and air conditioning in summer. They are relatively comfortable spaces. 3. I will be generalizing a lot but most libraries have programs that are entertaining and/or educational like music, book clubs, games, crafts, finance workshops. almost any topic of relevance to the community might be covered. 4. You can use their computers for internet, work, printing, scanning. Usually there is a time limit but it is pretty generous. You might be able to access free wifi. 5. Of course there is the books and other materials like magazines, dvds, music, etc. Some libraries check out toys, video games, cake pans, games, av equipment, and instruments. You can use them there or take them home. 6. If there is something you want but your library does not have, you might be able to get it for free from another library with interlibrary loan. This is an amazing service many people don’t take advantage of. 7. For example, I just got a $50 textbook that I could download as an ebook for free. In some cases it is a temporary loan and in my case I could save the PDFs. 8. Libraries have access to some amazing free online stuff. Look for Hoopla which lets you stream audiobooks, music, books, and video. Your library might have something different. NYPL has Kanopy which lets you stream Criterion Collection movies. 9. Some libraries will let you rent out a room for studying or having meetings for free or for a relatively small price. Chicago Public Library even has rooms to practice playing music. 10. Your library probably has access to online newspapers or other journals and databases. You can sometimes request specific articles if your library doesn’t have it. When I was in HS I got an article mailed in from a college library so I could use it in a research paper. 11. If you ask the library to buy a book they don’t have but SHOULD, they usually will AND they will put it on hold for you so you’re the first one to get it when it comes in. You can get on a waiting list for upcoming releases even if you aren’t first. 12. If you live near a college or university you might be able to use their library too. Don’t forget about those! The library I work in lets visitors come in and they can use our databases and computers. It’s really useful for doing research! 13. 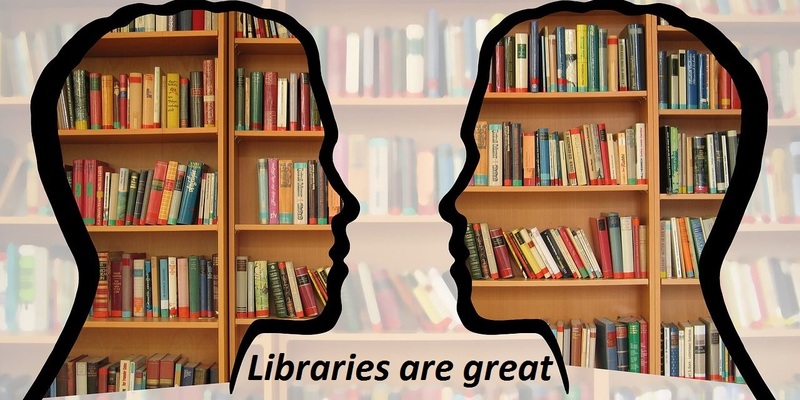 A librarian can give you great reading (and listening/watching) recommendations and help you find awesome resources on a topic if you have a general idea of what you are looking for. 14. Library programs for kids are usually pretty robust and fun/educational/entertaining. Anything from early literacy and movement programs to puppet shows to getting your photo taken with Curious George (me in a CG costume). 15. There was (and still is) usually something going on for kids every day at my small hometown public library. But also: so many picture books. Libraries are great because they let you take home piles and piles of books to read yourself or with your child! 16. I am going to lunch but there is so much more stuff like Libby ebook app which I love, makerspaces, borrowing from other libraries with just one card, and placing holds, but really it comes down to just having a place that is open and welcoming. 17. When I was a supershy teen I joined my library teen group and volunteered and actually left my house and talked to people and then I got a job at the library and now that is my life. 18. If you are in college or teach at one or do research at all go meet with a librarian. Even just email them and describe a little about what you are doing. They will help you find so much stuff. 19. Just wander over to your library and be like “what are some cool things I can get/do/see here” and find out specific services in your library. 20. Some libraries host or lead classes for ESL, citizenship, resume building, and computer skills. My public library recently hosted a free tax filing workshop. 21. Libraries do all of these things with very little money. Most of their services are low or no cost in comparison to other places that do similar things. They encourage self-service but also make sure someone is there to assist you. 22. If you are writing a paper, an article, or a book, a librarian can help you cite your sources correctly and more efficiently. They will help you find resources to do your research more deeply & effectively too. 23. If you are out of town you can visit the library. It’s probably beautiful. There is most likely some kind of unique display of some kind: a gallery of photos, a thoughtful collection of books on a specific theme, or a local kid’s collection placed behind glass.